As you approach the restored Stables, Cotton cottage and its romantic Jacobean style turret, mullion windows and private garden comes into view. This cottage was originally the Coachman’s house. 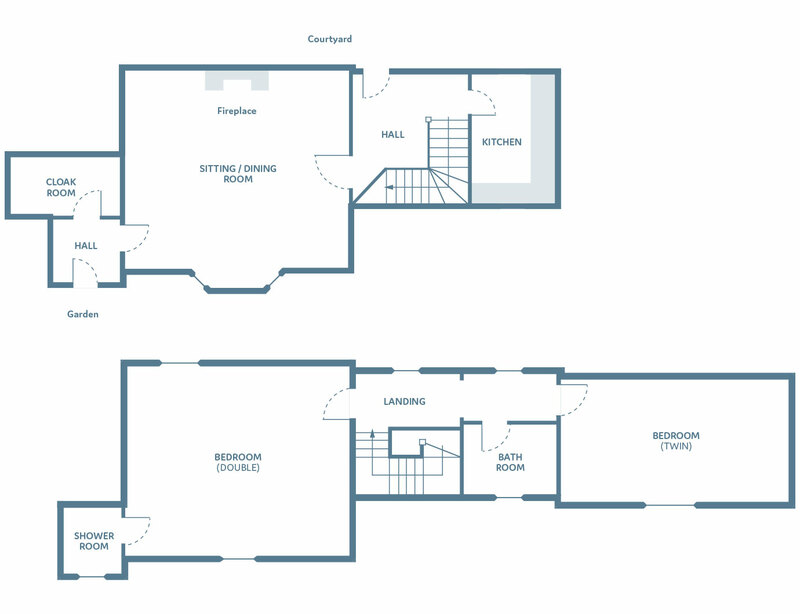 Bedrooms: One double room and one twin room. Beds can be linked to create a double. Bathrooms: One family bathroom with hand held shower. One en-suite bathrooms and one toilet downstairs. Cotton cottage is accessible from both the garden and the cobbled stone inner courtyard. From the garden, you go up two stone steps into a small hall, with downstairs cloakroom, perfect for coats and boots, and step right into the light filled sitting room with a wood burning stove in a gothic alcove. This cottage is decorated in an Indian style, painted a fresh light green and has an alcove sitting area, comfortable sofas and dining table for four. Paintings, prints and antique furniture enhance the overall design theme. Off a second hallway, which can be entered from the courtyard, the bespoke fitted oak kitchen has rich burgundy and cream tiles and blinds. Cotton cottage houses two first floor bedrooms. The double bedroom, with its original fireplace, splendid four poster bed and custom made furniture, is set off with the rich crimson fabric with a strong floral motif. An en-suite shower room and loo has been neatly tucked into the turret. Across the hallway, the twin bedroom is decorated in calm shades of green and cream, with specially designed beds and original furniture. Your own private bathroom with hand-held shower is next door.